The Uzi by Larami was one on the common style of realistic looking water guns available in the early 1980s. 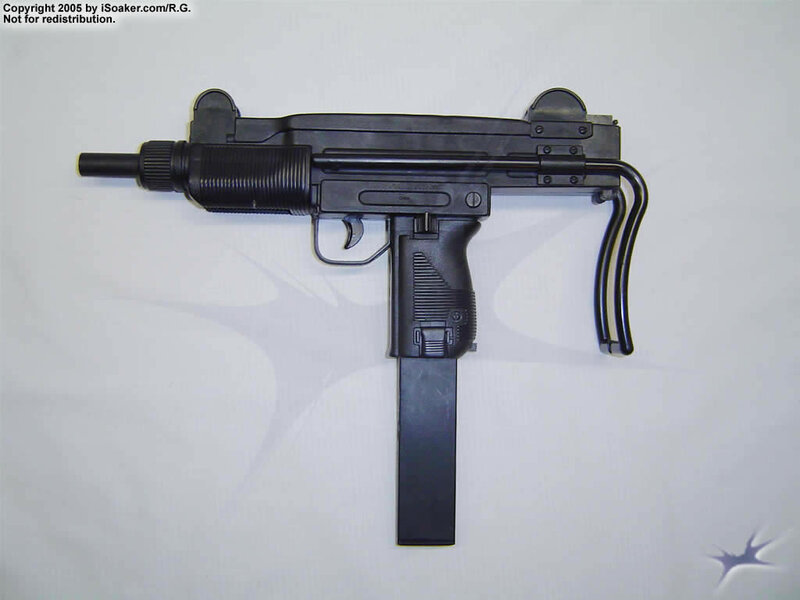 Battery-operated, the Uzi would unleash a near constant stream while the trigger was depressed. While potent, the small reservoir clip as well as reliance on battery power meant more limited use during water fights. As well, the motorize pump was ore liable to have problems should the internals get wet. The smaller internal tubing was also more prone to being clogged. However, the greatest strength and weakness of this style of water gun is its realism in terms of size, shape, and colouring. As similar, realistic-looking water guns were too often mistaken for real ones, tighter restrictions ended up being placed on water gun styling by the end of the 1980s. Our model unfortunately is no longer in working order, thus little can be measured in terms of its performance. A good water gun for its time, the Larami Uzi provided good fun. However, in the modern day, it would be unwise to wield this blaster in battle for fear of mistaken identity. It is interesting to see this styling of water gun made by Larami prior to the advent of the Super Soaker. Good stream, pumpless (due to battery power), and realistic styling for role-playing. Battery powered with limited capacty. Realistic styling problematic and lead to more restrictions placed on the shape of water blasters due to kids being shot after their water gun had been mistaken for a real one.